At the core of everything we do here at Copenhagenize lies a simple celebration of the bicycle in every form. Of the bicycle as a liberating transport form for broken cities. Of the bicycle as the most effective form of indepedent mobility. Of the bicycle's historical role as liberator of the working classes and of women. 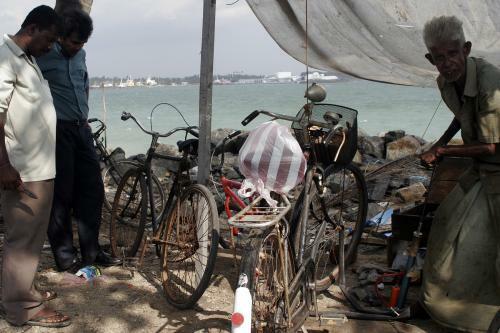 Of the bicycle's role in impoverished nations in Africa and beyond. Everything we do here on the blog and, more specifically, at our company is geared towards bringing the celebratory, liberating qualities of the bicycle to societies that once knew them but that have lost touch with them. We love the bicycle, we love the bicycle squeaking cheerfully under the asses of Citizen Cyclists everywhere and we salute the bicycle's role in the development of our societies for the past 125 odd years. We embrace it. We celebrate it. 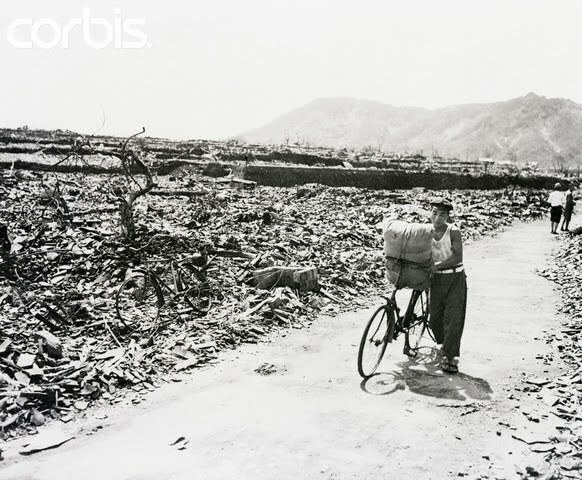 This is a man carrying goods on a bicycle after the Americans bombed Nagasaki with an atomic bomb in 1945. As ever, the bicycle fulfills it's role as an integral tool. A workhorse. A functional and practical transport form. In the case of this man, it is assisting him in transporting what we can only guess are incredibly important goods. By showing photos of the bicycle's role in the bleak landscape of the hardest hit regions of the proud nation of Japan in this previous article we are, in a seemingly endless hour of sorrow, placing positive focus firmly on the role of the bicycle. 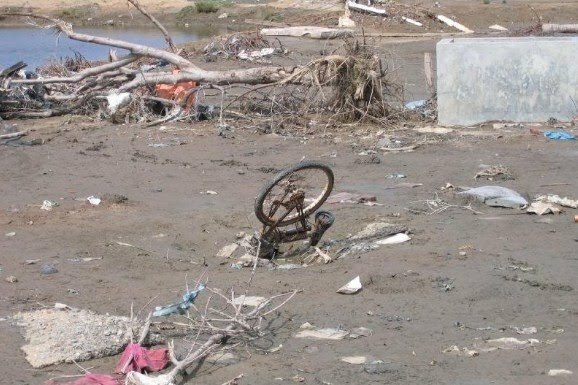 In the unfathomably ravaged terrain with the air filled with not only the stench of destruction and death but also the thick, heavy sensation of despair, we are proud to show how citizens of are using the bicycle. To search for loved ones. 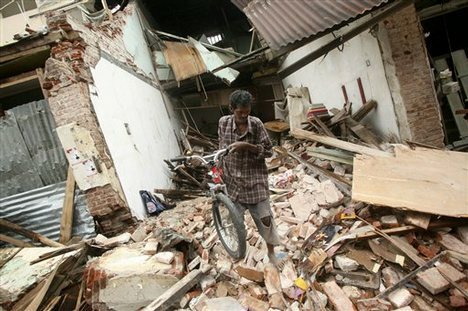 To gather the remnants of their belongings. To get home to their family in lieu of public transport or cars. The photos show the how versatile the bicycle is. How timeless it's role in society is. How it assists citizens in their darkest hour. An hour that most of us can never imagine. 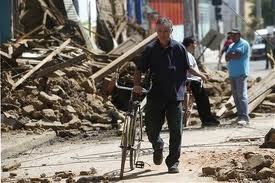 A man salvages a bicycle after the tragic earthquake in Concepcion, Chile in 2010. 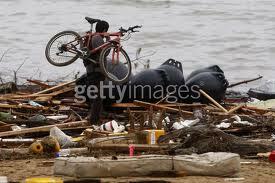 The bicycle, apparently, is regarded as a vital item to salvage in the destroyed city. 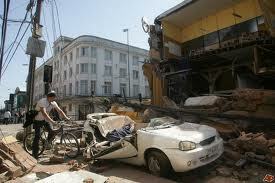 More photos of the bicycle's role in the aftermath of the Chilean earthquake. Three photos of the bicycle's role in the aftermath of the earthquake and tsunami that struck Indonesia in 2004. 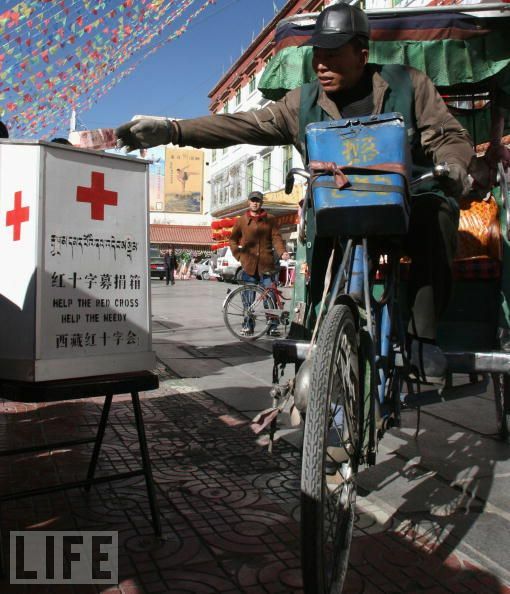 A photo of a Chinese man donating money to help the victims of the Japanese catastrophe. 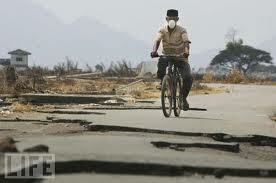 The bicycle's role is integral not only in areas stricken by natural catastrophe. 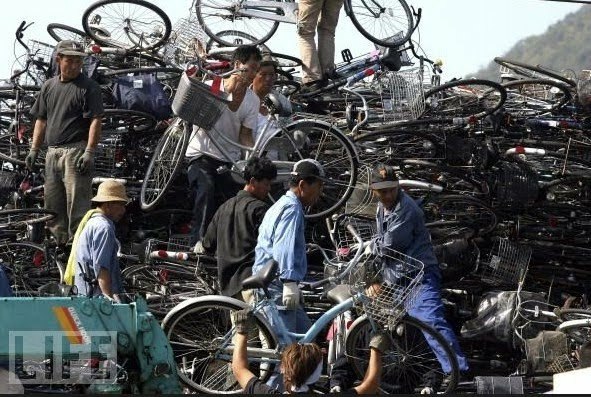 Here are North Koreans packing a load of used bicycles at the port in Maizuru, Japan on October 13, 2006 after the Japanese government adopted trade sanctions against North Korea after the country declared it had done nuclear testing of a device on October 9, 2006. The bicycles went off to North Korea to serve their indispensible role in a dictatorship, clearly regarded as important goods to transport back in light of the sanctions. It's not always a celebration. 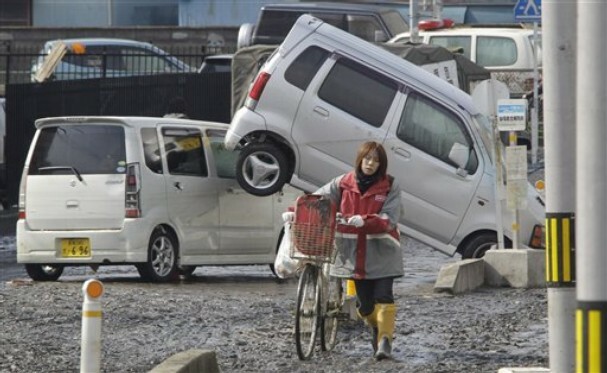 This Japanese bicycle is so symbolic that a simple photo like this is worthy of a news agency's photographer's attention. The bicycle contributes to the storytelling of these photographs, too. Not always positive. 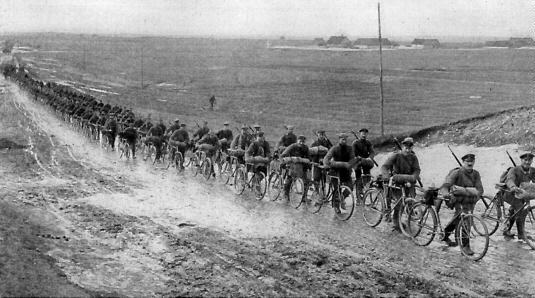 At left: a German bicycle battalion in the Great War going off to kill. 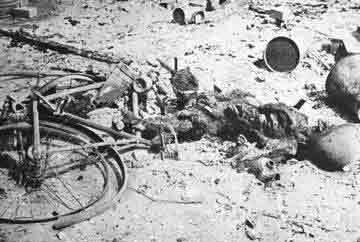 Middle: the charred remains of a boy and his bicycle in Dresden, Germany after the Allied bombing. At right: More recently, a couple killed by a sniper in Sarajevo. 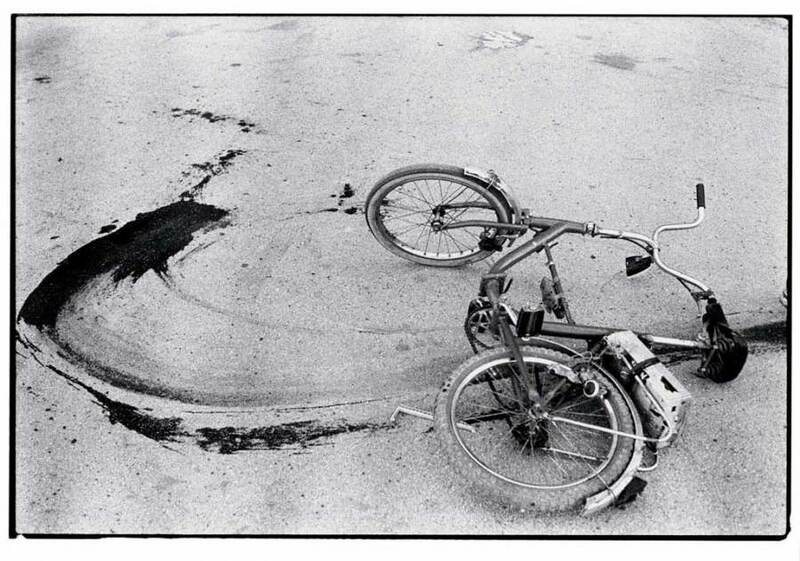 Who can forget the famous photograph by Annie Liebowitz of the bicycle and bloodstains of a boy killed by a sniper in Sarajevo. Let us return, shall we, to the bicycle as a symbol of hope? 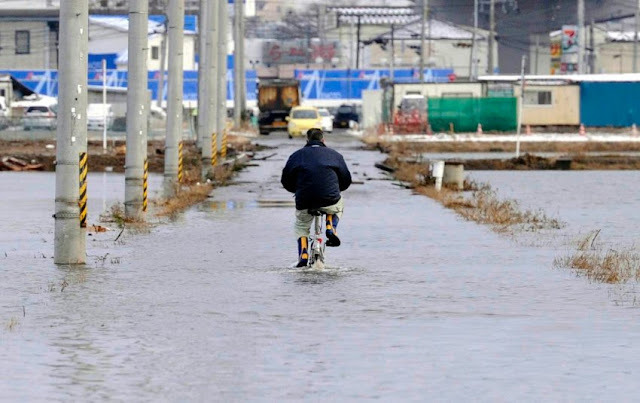 Marc from Amsterdamize has a Flickr set about the tragic 1953 floods in the Netherlands, where the bicycle - like in Japan - played an integral role. 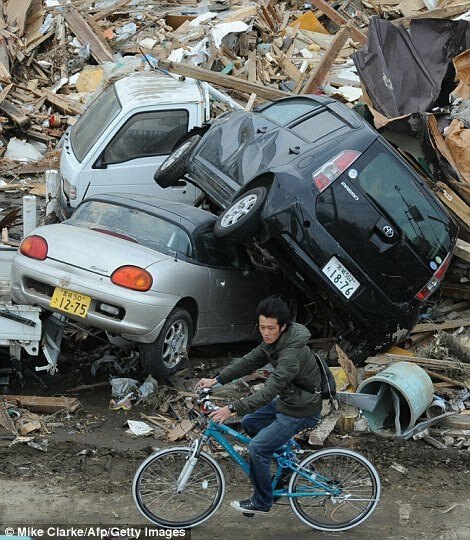 And let us return to Japan where, as these words are being written, the bicycle once again proves its worth, assists where assistance is needed and provides citizens with transport when they need it most. 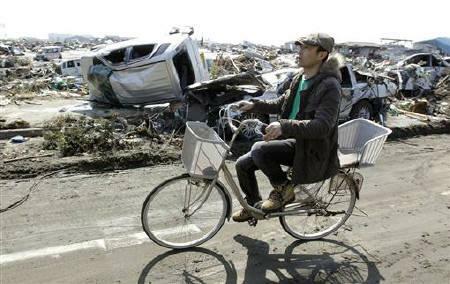 Long live the bicycle and whatever small role it can play to help the Japanese people.